These allergy air filters by Electro Breeze are designed for those who suffer from asthma, allergies and multiple chemical sensitivity. These statements speak for themselves! Mutant strains of microbials have become resistant to the antibiotics formerly used to control them. Deaths from infectious diseases caused by these germs is now the third leading cause of death in the United States. Over 1/3 of our annual national health bill can be attributed to polluted air. No home or building is immune to indoor air quality problems. A Study conducted in Philadelphia tested homes for the number one allergy trigger, cat dander. They found 100% of the homes contained cat dander, despite the fact that many of those homes did not have a cat. The sad fact of the matter is that nearly all of you who are reading this segment are already affected by some type of breathing ailment. If you could do things over, you would make your home the safest place for yourself and your guests. Your indoor air is 2 to 5 times (and as much as 100 times) worse than the outdoor air. Your indoor air needs to be treated with allergy air filters, just like you would treat polluted water with filters. You would never offer your guests polluted water with your meal. Electro Breeze has presented you with an affordable option to rid your home of that air that is slowly building up an allergic symptom in you and your guests. In fact, many of you are benefiting from the Electro Breeze system and may not even realize it. The casino you might vacation to, the supermarket where you shop, the meat processor that supplies that supermarket are typical installations where smoke, bacteria and viruses are being controlled by the Electro Breeze air cleaner. Only 10% of the residences in the USA have an efficient air cleaning system. That means that 90% of American homes are still using a pleated or fiberglass filter that is designed to protect your furnace, not your lungs. Even the 3M filtrete allergen filters admit that they only clean down to 1 micron. 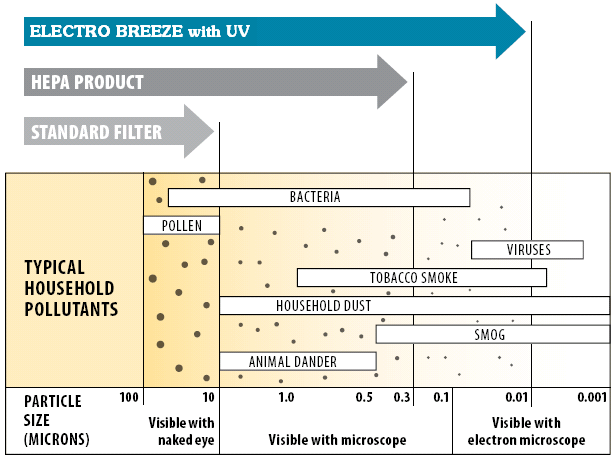 Look at the chart below and you will see that the allergens, bacteria and viruses reside in the much less than 1 micron size particles. The Electro Breeze air cleaner system removes allergens at 97% efficiency down to 0.3 microns. Coupling the Electro Breeze air cleaner with the UV kit takes your effectiveness down to virus levels. The cost for these allergy relief air purifiers is incidental compared to the dramatic effects of its operation. The replacement pads are comparable or less in price to the pleated filters (not to mention the Dynamic air cleaner filter) that you are supposed to be changing every 3 months. How do you figure a payback on saving yourself and those you love, from allergies, asthma and multiple chemical sensitivity?